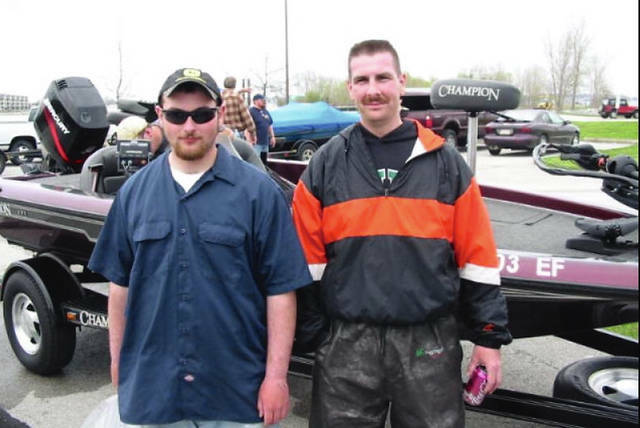 John Barnett and Rodney Arnold were second-place finishers in the U.S.A. Bassin Tournament Trail, Indian Lake Divisional in 2018. The Great Indian Lake “Fishing Tournament Trail” is Ohio’s Mecca of Inland Fishing Tournaments, as shown by this list - which is still growing. Over 43 fishing tournaments have already been scheduled at Indian Lake for 2019. This is a phenomenal number of tournaments to be registered with the State Park, and it’s only April. It is expected that even more tournaments will be added, possibly breaking last year’s mark of 50 fishing tournaments occurring at Indian Lake. This is a large number for any size lake. One could easily make the argument that Indian Lake is the inland lake “Fishing Capital of Ohio,” other than Lake Erie (which is actually too large to be contained within Ohio’s borders to be categorized as an inland lake). These are prestigious, popular and official fishing tournaments registered with the state of Ohio and hosted by Indian Lake State Park. Each year they bring a significant economic impact to the lake and its communities with participants and organizers spending money at campgrounds, bait shops, cottage rentals, restaurants and stores. Indian Lake is one of the largest inland lakes in Ohio with over 5,000 acres and 46 islands. It has an average depth of 10 feet, a maximum depth of 24.8 feet and is known for its abundant fish and size. Attracting thousands of recreational anglers every year, it has always been a very popular lake to fish and known as a great fishery for bass, saugeye and crappie. In fact, it is consistently rated by the Ohio Department of Natural Resources as the top lake for numbers and size of saugeye. The lake is also considered the best inland lake in the state for ice fishing. Indian Lake is typically known for boating, parties on the beach, sandy beaches, lake houses and festivals. But actually, one of the most popular attractions at Indian Lake is its top notch fishing – as is evident by its impressive and staggering list of annual fishing tournaments to which the lake plays host. The sport calls these fishing competitions “fishing tournaments,” “tournament trails” and “fishing circuits.” Some of the popular tournaments to be held this year include: the Doug Hanes Memorial Ice Breaker, Trophy Bassmasters, Scott Kuhn Memorial Saugeye Tournament, Central Ohio Crappie Circuit (OCC), Ohio Bass Nation Qualifier, Ohio Megabass Tournament Trail, Buckeye Bass Elites, Indian Lake Catfish Tournament and the Mid-Ohio Saugeye Trail. The launch locations of most of the tournaments are at one of these following launch areas: Moundwood, Blackhawk, Lakeview and Chippewa. Most tournaments scheduled are catch and release. Approximately 50 percent of the tournaments are still open for entry for interested anglers. If you would like more information on how to participate in one of these fishing tournaments, please contact the Indian Lake State Park office. 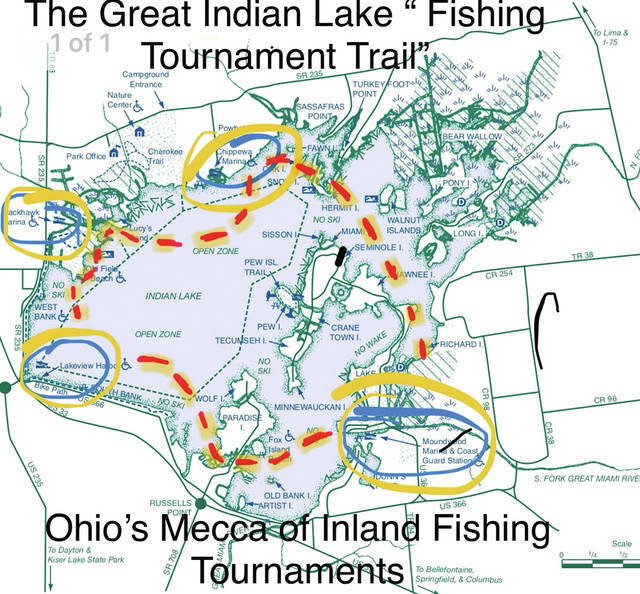 The Great Indian Lake “Fishing Tournament Trail” is Ohio’s Mecca of Inland Fishing Tournaments, as shown by this list – which is still growing. Ron Brohm is a contributing writer to this newspaper.